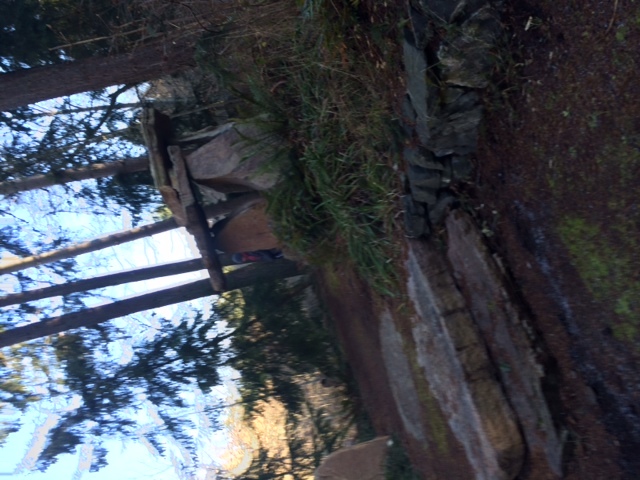 I walked through a portion of the Earth Sanctuary on Whidbey Island today. The sun was shining. The Osprey were overhead. The path was muddy. The air was crisp. I had a dear traveling companion with me. It was perfection. At the end of the walk, I kept my appointment with The Lady in the Dolmen. She was the reason I got it into my head that I needed to spend New Years Day at Earth Sanctuary. She was the being with whom I made my first appointment of the year. I met The Lady on my last visit to Earth Sanctuary. 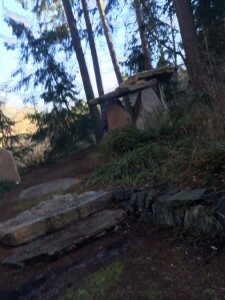 Stepping into the Dolmen…a rock formation that is said to have a very distinct Divine Feminine energy source, I felt that strong spirit and I found myself on my knees. A prayer posture I have not often used. A prayer posture that has in the past made me both physically and emotionally uncomfortable. A prayer posture that I could not help but find myself in again today. Then as now, my knees where the right part of my body to press to the ground. When last I was in the Dolman, I prayed for wisdom and clarity to speak words of freedom and grace over the ladies I spoke to at a retreat in October. That visit, I felt a certainty and reassurance in my spirit that allowed me to press forward with research, planning, writing and speaking. That request was met with great love and agreement in that sacred space. It was a tangible feeling in my heart. Today, from my knees, I asked The Lady for an open heart. A heart open to loving myself, others, a man, and so many others. I asked that I become more present and mindful of each passing moment…no numbing….no losing days. And The Lady replied with the most vibrant mental image of a flower…moving to and fro in the breeze waiting to be opened. And the flower could not be forced open or pried open. Instead she was coaxed…through acts of love, and kindness, and grace…to open to reveal the splendid nature of her bloom. And that my friends is the challenge. To bloom. To bloom at the proper time. To bloom under the right circumstances and in response to the right conditions. To bloom when all you want to do is protect the petals. Excuse me while I go get my bloom in order.